To complete the MRSA discussion, it is necessary to mention the final group of MRSA – livestock-associated MRSA (LA-MRSA). Just as healthcare-associated MRSA (HA-MRSA) and community-associated MRSA (CA-MRSA) are (at least initially) distinct from each other via differences in their genetic make-up, LA-MRSA represents yet another separate path of evolution for MRSA, with its own set of genetic and phenotypic characteristics. LA-MRSA was discovered late relative to CA- and HA-MRSA. The Canadians described MRSA in horses and “horse-associated” personnel in a 2-year study starting from 2000, whereas the French described MRSA in pigs and pig-farmers (but not in bankers or insurance agents who served as the human controls) in another study published in 2005. But rather ironically, the Netherlands had the highest rate of LA-MRSA initially. The Dutch have one of the lowest HA-MRSA rates in the world, comparable with the northern European/Scandinavian countries as well as West Australia. They had also articulated the “search and destroy” concept for HA-MRSA, bringing the term into the infection control lexicon. “Search and destroy” for MRSA appears to have more detractors than adherents among infection control experts, but personally, I feel you cannot argue with success. In any case, it was perhaps because there is so little HA-MRSA in the Netherlands that the initial cases of LA-MRSA were noticed – one of the first being a 6-month-old girl who was due for thoracic surgery in July 2004. In Singapore, for example, such a case would hardly have elicited the same excitement or intense search (both the parents were also positive for MRSA, and because they raised pigs on a farm, the pigs were also screened). These cases were the sentinel event for what would subsequently be a national outbreak of epidemic proportions, among both pigs and humans in the Netherlands. Using multilocus sequence typing, various investigators have found that there are distinct lineages of animal Staphylococcus aureus (and therefore MRSA), that are only transferred to humans that work closely with these animals. Among cattle (and a frequent cause of bovine mastitis), LA-MRSA have been found belonging to clonal cluster (CC) 130 (comprising ST130 and other closely related STs), ST435 and CC705, with a unique mecA homologue. 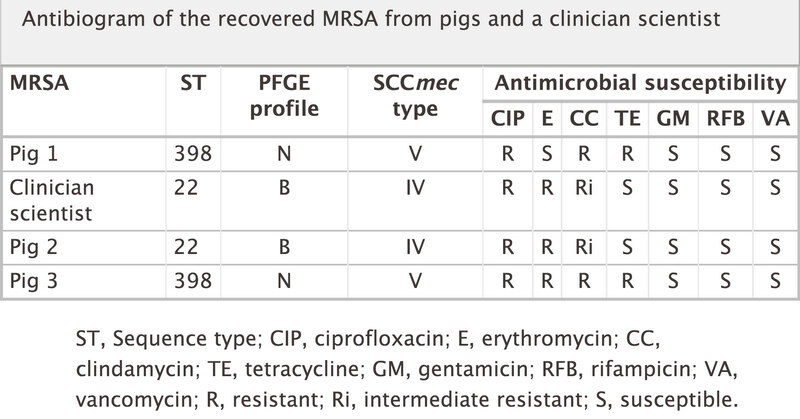 Among pigs and their handlers (and also rabbits raised for their meat), by far the most common clone of LA-MRSA is CC398 (comprising ST398 and other closely related STs), although ST9-MRSA-IX is also common among pigs in parts of Asia. Unlike CA-MRSA, LA-MRSA are generally resistant to multiple other non-beta-lactam antibiotics, reflecting the multiple types of antibiotics used in the process of animal husbandry. It is plausible that the rise in LA-MRSA is associated with the increased use of antibiotics in animal husbandry – recently researchers in the Netherlands showed a positive correlation between antibiotic use on the farm and the prevalence of LA-MRSA in both animals and humans. Singapore phased out pig farming in the 1980s. However, pigs are still kept in Singapore for reasons of research and training. I remember having to stick tubes and perform minor surgery on anaesthetised pigs (and goats) during advanced trauma life support (ATLS) training in the past, and such large animals are still used for surgical training locally. Therefore there are LA-MRSA in Singapore, although I do not know of any case of human infection locally. In 2005, LA-MRSA was unexpectedly isolated from a pig used for diabetes research (it had died of sepsis), and this led to mass screening of pigs held at various facilities in Singapore, as well as screening of the veterinary and research staff associated with the pigs. Three (2.4%) pigs – including the original that had died – were found to harbour MRSA, as did one research scientist (who was also a surgeon). Two MRSA belonged to ST398, which was expected. The human surgeon-scientist had UK-EMRSA-15, which was also unsurprising. What surprised us was the finding of UK-EMRSA-15 in a pig, although there was no apparent contact between the animal and that particular scientist. In a subsequent investigation a few years later, we also found ST9 MRSA in another pig locally, showing how widespread these LA-MRSA clones are globally. What is the threat of LA-MRSA to humans? It turns out to be much less than HA- or CA-MRSA, although it is still not to be dismissed. Strains of LA-MRSA are capable of being transmitted between humans, although they are less efficient at spreading compared to HA- or CA-MRSA (probably because humans are not the natural hosts of these MRSA). Although severe infections have been described, LA-MRSA are possibly less pathogenic compared to other human-adapted MRSA. However, virulence genes are fairly easily transferred between MRSA, so the situation may yet change in the near future.